A Custom Drill Design can be created for Any Marching Band Show offered in our XtremeBrass & Percussion catalog. Have our staff of professional drill designers craft a Custom Designed Drill for your Marching Band. 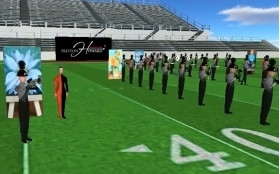 The show will be written for the exact number of players in the wind, percussion and auxiliary you have in your group. The visual design will be custom written for YOUR specific numbers and instrumentation. "XtremeBrass & Percussion" has teamed up with "Pyware" to make available to all customers who purchase a "Custom Designed Drill" a 3D movie of the drill powered by "Pyware's" amazing 3D Drill Software. The 3D Movie is perfectly synched to the music of the show that you purchased and can also include these fabulous extras. Now How Cool Is That??? Here's a sample of "Passion". Music by Gary P. Gilroy, Shawn Glyde & Nate Bourg. Drill by Preston Howard. Download a sample PDF of the first five pages.